Miss Luthuli is a serial entrepreneur, passionate about life, nurturing and developing brands, companies and human potential for growth. She's a mother of two, an avid runner who loves traveling. Backed by extensive Corporate experience in Unilever management, Nox founded Bloom Marketing, an integrated marketing communications agency, specializing in Marketing Strategy Development and Brand Activations based in Durban and Johannesburg. She has been the MD of the this award-winning agency for the past 14 years, crafting remarkable activation campaigns for multinational corporations such as Unilever, Perfetti Van Melle, Austrian Energy Drink ~ Powerhorse and leading local enterprises like Vodacom, National Brands, City Of Joburg, Tourism KZN to name a few. She believes in the extraordinary power of brands to change and influence life positively, as such she Founded LUTLUXE LIFESTYLE BRANDS. An agile sister company to Bloom Marketing specializing in conceptualizing and developing lifestyle brands riding the speed of the latest technology and digital trends to creatively solve every day challenges. In 2014, LUTLUXE LIFESTYLE BRANDS developed and launched one of its kind Make_Up Mob brand, a sophisticated and convenient make-up boutique, servicing various industries ranging from event, weddings, film production, fashion shows and commercial shoots, which won the Best Women-Owned Business Award at the Essence Festival, Durban Business Fair. Miss Luthuli is a well-accomplished businesswoman, recognized by the CT & DBN Film Commission in 2009 as one of the four Young Creative Directors moving and shaking the creative industry to attend Cannes Film Festival. She was nominated as one of the Cosmopolitan Magazine’s 2009 Fun and Fearless Females. In 2011, she won the BWA KZN Regional Business Achiever Entrepreneur Award. As a sterling businesswoman, she has won the 2011 and 2012 UMYEZANE Black Economic Achievement Award for Best Black Female Owned Business in KZN, by The Department of Economic Development & Tourism. 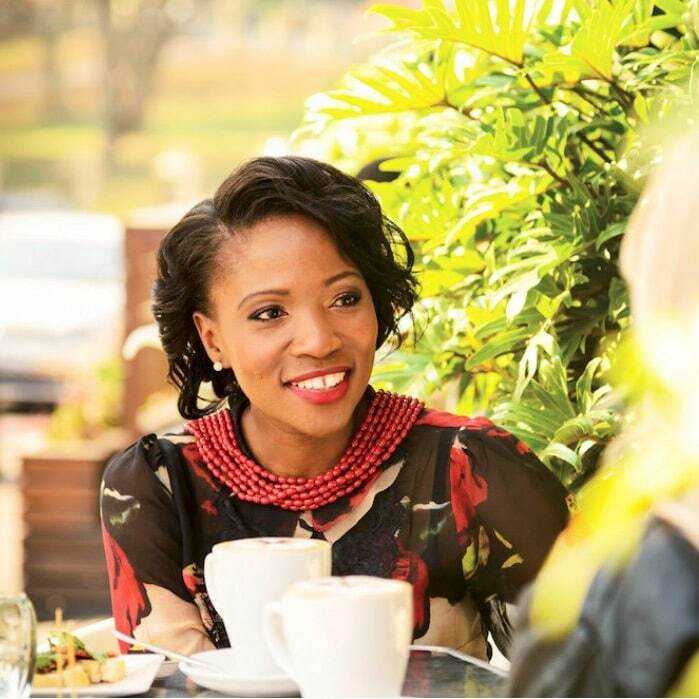 Nokuthula believes in serving and sharing her expertise and gifts to help others bloom. She has been invited to judge various industry awards such as the South African Council of Shopping Centres (SACSC Awards). In 2016, she was invited as a Judge for the largest creative awards in SA and the Middle East, The Loeries, and also invited to join the Advisory Council of Vega School of Brand Leadership. HER LIFE MOTTO ~ BLOOMING IS THE ONLY EVIDENCE OF LIFE… WHEN YOU STOP BLOOMING, YOU ARE DEAD! This motto fuels her strong passion for Women Empowerment and Leadership Development. Following her moving Keynote Speech for Ithala Enterprising Women event and numerous other speaking engagements at women organizations and events, she was moved on her 40th birthday to help as many women lean in through a series of Leadership Workshops to LEAD YOUR LIFE. Bloom Inside Out has a Connect and Coaching model to unlock women & youth potential, eradicating limiting beliefs and helping them pursue their passions and realize their dreams towards prosperity and gender equality. This is based on her unwavering belief that every person is BORN TO BLOOM, why then others are successful and other are not, she has developed Masterclasses to address this disparity. She hosts monthly BIO-Masterclasses to change the narrative and turn up the voice of women in business, professional and unemployed women facilitating pertinent conversations of where they are and where they want to, whilst imparting insights, lessons and strategies on how to get there and develop their leadership competence. She speaks and consults on the Power of Personal Branding to help women package, position and profile themselves well to increase their relevance and equity in the market for success.